Complete the words has a proven track record in schools to improve spelling and writing performance. The fun way to improve kids ABC, alphabet, letters and spelling whilst keeping them amused for hours. 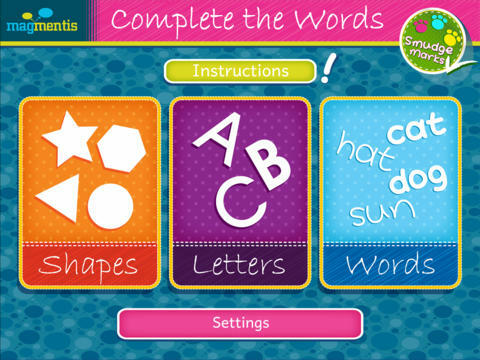 Magmentis is proud to bring you Complete the Words, the new version of this popular software already used by several hundred thousand children in schools all over the world (and by more than the 30% of primary schools just in the UK) to improve pupils' ABC, spelling and word recognition skills. Start the app to a bright, colorful menu screen with different exercises: Shape Matching to words First Letter matching to words Word Matching to pictures Learners will enjoy matching missing letters, words and shapes in words spoken to them by a professionally recorded lady's voice. Whenever you wish, you may go to the Smudge Marks screen where Smudge has recorded right and wrong answers to monitor your learners’ progress. Learning first words using Complete the words has been proven in schools all over the world for nearly 20 years. Developed with active support from educational experts and with a proven track record in schools across the globe, Complete the Words is suitable for native English speakers and also for those learning English as a foreign language. Specially chosen words along with, graphics and sounds that appeal to a global audience of learners have already ensured Complete the Words' success with teachers the world over - improving spelling and writing ability for an entire generation of young learners.